This special collection includes three full length novels - hundreds of pages of well-researched adventures and thrills - for the price of two individual volumes. Fans of George MacDonald Fraser, Ian Fleming and John D. MacDonald will enjoy former Army Ranger turned covert agent Jake Fonko's globe-spanning adventures. 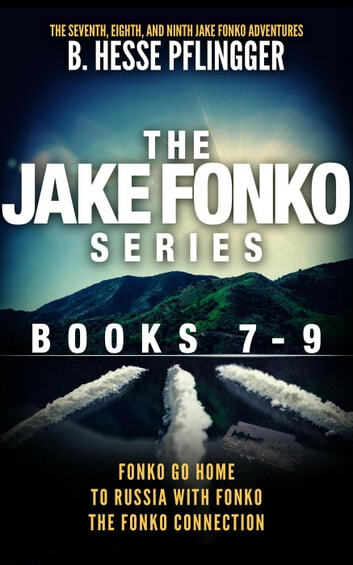 Includes: Fonko Go Home (Book 7), To Russia With Fonko (Book 8), and The Fonko Connection (Book 9). Fonko Go Home – Serbia, 1992. Jake Fonko bumps into an old flame and soon finds himself caught between the Russian Mafia, a Hong Kong crime family and both sides in the Serbian Civil War. To Russia With Fonko – Moscow, 1993. When an old friend calls Jake Fonko with a desperate plea for help in retrieving stolen millions, Jake finds himself in the middle of post-communist Russia–a shattered empire teetering on the edge of collapse. The Fonko Connection – Colombia, 1989. A routine bodyguarding gig goes south when Jake's client strands him in Medellin. All alone, and without backup, Jake must make his way through drug cartels, arms smugglers, and the CIA if he wants to get back home. For modern history buffs/adventure/humour/travel lovers, the Whole series is MUST READ. I suggest in sequence. A close look at the author's name should give you a clue as to what you're in for. I've traveled and lived in many of the cultures in which the various books are set and they're bang on. Heck- I may even read them at least one more time!